Opponents of the Waxman-Markey climate bill are resorting to the time honored tactic of exaggerating the costs and downplaying the benefits. Waxman-Markey, more formally known as the American Clean Energy and Security Act or ACES, is attracting the same sort of economic bamboozlement that we saw during the fight over wind power here in Delaware. ACES would create a market of emission allowances that would shift billions of dollars from fossil fuel technologies to conservation and renewable energy projects. With that kind of money at stake, opponents are pushing the familiar line that we can't afford to act on climate change. 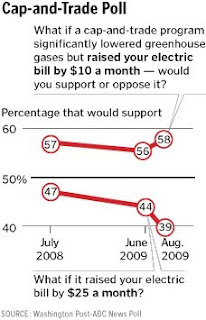 A Washington Post/ABC News poll has measured the public's tolerance of higher energy prices stemming from action against global warming. It turns out the poll's break point matches the argument over the net cost of ACES. The Heritage Foundation has circulated the claim that Waxman-Markey would add $1,500 to a family’s annual energy budget. On the more modest end of the scale, the EPA projects a lower figure of $80 to $111 per household. But the more significant part of the equation isn’t the outlay, it’s the size of the potential benefit from energy conservation. A recent report from McKinsey & Company projects that $520 billion in investment in energy conservation would reduce energy use by 23 percent by 2020 and return $1.2 trillion in cost savings. A report by Environment Northeast, a non-profit think tank, projects that Waxman-Markey would generate $627 million in energy efficiency investment in Delaware, and return $1.882 billion in savings, which is one reason why Delaware isn’t waiting for the federal government to act. Governor Jack Markell recently pushed through legislation that would reduce peak electricity demand by 15 percent by 2015 through conservation. Acting on climate change will create net enormous benefits for energy users. If Waxman-Markey's advocates can get that message through to voters, then support for meaningful action on climate change should carry the day. It is hard to blame the right wing. They routinely lie, dissemble and obfuscate as a matter of strategy because it works. It works like a dream thanks to people like your buddy, Allan Loudell, who play along by treating every story as a "he said/she said" partisan squabble. In fact, I'll bet if you end up on his show talking about this, he will take up the lies and promote them alacrity. "If Waxman-Markey's advocates can get that message through to voters, then support for meaningful action on climate change should carry the day. Yes, the Waxman Markey bill is designed to cap emission into our ozone--sounds like a good idea in retrospect, but it does cost the citizens more money. With less emission allowances, less factories are built, less jobs result, and with fewer workers less access to our natural resources.